In addition to state-of-the-art convection cooking, GE’s latest wall ovens feature Wi-Fi connectivity that does everything except take the casserole dish out of the fridge for you! 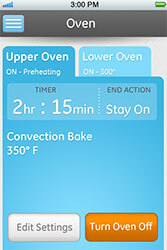 GE’s new mobile app Brillion lets users preheat the oven, set the timer, change temperatures and cooking functions, and check the cooking status without even being in the house! Get the app here for your Android or iPhone and you can preheat your oven from the grocery store!